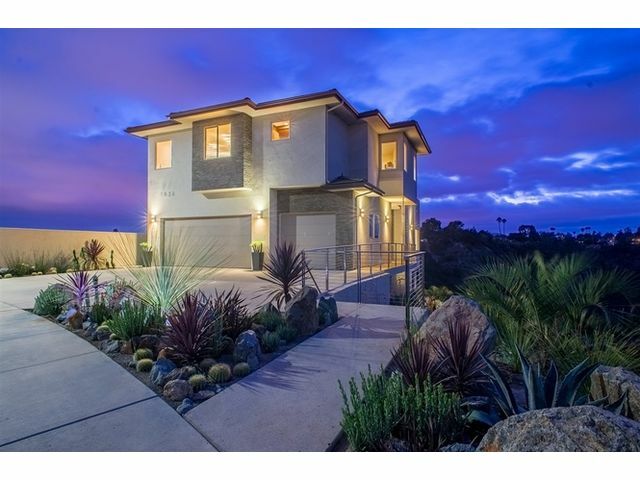 This Detached property was built in 2016 and is priced at $1,850,000. Please see the additional details below. Brand new construction! This Ocean/Bay View contemporary home seamlessly blends modern design & green building features. The innovative design lets in light, air & sweeping views of Stevenson Canyon, Mission Bay & the Pacific Ocean. Expansive open floor plan, high ceilings, over-sized windows & 12' arched doors afford unparalleled feelings of warmth and brightness. Impeccably finished w/ black walnut cabinetry, limestone floors, Italian cooktop, Viking appliances & a 1100' sky deck w/ 14 ft fire feature. Some of the "Green" features include solar panels, 2300 gallon rain water retention system, electric car plug-in, California native and xeric landscaping and backyard path to open space protected canyon. One of the best features of the home is the premium temperature controlled 178 bottle wine cellar. Clairemont / Bay Ho is a community within the city of San Diego overlooking Mission Bay and surrounded by Tecolote, Stevenson and San Clemente preserved open space canyons. The community of about 80,000 was originally called the "village within a city" and incorporates winding streets and scenic view lots to take advantage of the canyons and bluffs overlooking Mission Bay. One of the first communities to integrate residential living, retail shopping, commercial business, schools and libraries, this approach was considered novel at the time. Today, the City of San Diego's Morena redevelopment corridor offers new restaurants, bars, breweries, coffee roasters and, in the near future, the mid-coast trolley to downtown, Fashion Valley and UTC Malls. No traffic, easy access to downtown and beaches, convenient shopping, many ethnic markets and a perfect climate. Twelve elementary schools, two middle schools, two high schools and a community college. Tecolote Golf Course and Krause Family Skate/Bike Park and numerous pocket parks provide ample outdoor sports venues in addition to quick access to Mission Bay and the best San Diego area beaches.